Bird, R.M. and M. Smart. "Public Debt". The Canadian Encyclopedia, 30 May 2018, Historica Canada. https://www.thecanadianencyclopedia.ca/en/article/public-debt. Accessed 20 April 2019. In 1867 Canada's debt was $94 million and it grew slowly until 1915, when WWI pushed the figure to $2.4 billion. 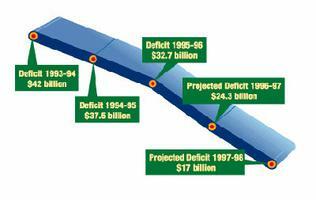 During the Great Depression the debt rose to $5 billion, and by the end of WWII it had reached $18 billion. Governments finance their expenditures by taxing and borrowing. They sometimes raise money from the public or from institutions by selling securities, eg, bonds. The accumulated total of all such government liability is called the "public debt." The interest and principal on the portion of public debt held by nonresidents, when repaid, represent debits on Canada's BALANCE OF PAYMENTS. Long-term debt, eg, that due in 10 years or more, is usually in the form of bonds; short-term debt indicates a maturity date of less than 5 years. Direct obligations comprise securities issued by government itself; contingent obligations comprise securities issued by government corporations, eg, funds for corporations such as Ontario Hydro are raised by bonds issued by them and guaranteed by the respective governments. As a proportion of Gross Domestic Product (GDP), the federal "debt ratio" grew from 23.8% in 1981 to 47.4% in 1986 and 71.4% in 1996. This "net debt" is the difference between gross debt (unmatured government bonds, bills, notes and other liabilities) and certain recorded financial assets of the federal government, eg, cash, investments and loans. Basically, changes in net debt equal budgetary deficits or surpluses, and the federal government's total net debt at any time therefore equals its accumulated overall deficit since Confederation. Public debt charges (interest) have risen concomitant with the increase in debt, reaching $47.8 billion in 1996, or about 27% of total federal expenditures, compared to only 15.9% in 1981. This increase has led to the perception that government has been on a debt treadmill, borrowing to service past debt and exacerbating the deficit problem. The 1980s were also notable for the substantial increase in debt of subnational governments. 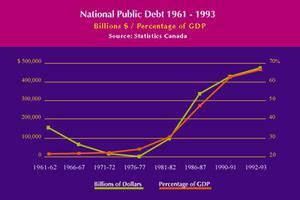 In 1981, the net debt of provincial, territorial and local governments stood at $29.4 billion on a consolidated basis (ignoring liabilities of one government that are assets of another), or 8.2% of GDP. Much of this debt financed capital expenditures which would benefit future generations that would bear the cost. In 1995, after a prolonged period of operating deficits incurred by some provincial governments, the net debt stood at $208.9 billion, or 26.9% of GDP. As a proportion of GDP, the public debt was larger at the end of this period than it had been since 1947. The management of the federal debt, an important aspect of MONETARY POLICY, has become more complicated in recent years, as the growth of borrowing requirements has led government to increasingly rely on short-term treasury bills in place of long-term bonds. Because the government debt has shorter maturities, debt service charges are more vulnerable to interest rate variations. This trend began to reverse in the mid-1990s, however, as government increased the proportion of long-term, fixed-rate marketable bonds in total unmatured debt. Provincial governments have issued debt in foreign currencies to gain better access to international capital markets. This has exposed governments to exchange rate risk as well as interest rate volatility. Economists have long debated whether the increase in public debt is a significant problem. In one view, the public debt is funds we owe to ourselves and the decision to pay later rather than sooner is irrelevant. But transfers between taxpayers and bondholders in the future may have significant and unintended consequences for the distribution of income. Public debt could also lead to increased interest rates and reduced economic growth throughout the economy as public borrowing displaces private investment. There is little evidence, however, that this has occurred. Large-scale government borrowing may also induce INFLATION through the expansion of the money supply. Finally, the increase in the debt led to a significant rise in net foreign borrowing in the 1980s. The result is that the public debt is now increasingly owed not to ourselves but to foreigners. Repayment of debt to foreign creditors will likely create a substantial drain on the economy.